The Korean Smartphone manufacturer has revealed a new accessory to provide a great gaming experience to the Samsung Flagship device users. These days the Flagship device are large enough to give the users a good gaming experience provided they are equipped with the power processor to handle them without any lag. So, to provide the users with a unique features they have revealed Samsung Gamepad which will be used with the Samsung Smartphones specifically for gaming. Logitech was also in the news for the same type of device for iPhone. The idea and design was almost the same but the price of the that device was too high. 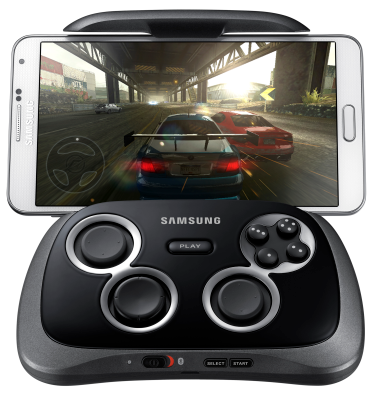 This Samsung Gamepad will be available for the Indian Users at the price of 4,999 INR. Now, as per its compatibility it says that the device should be operating on Android v4.1, so though we have not used this device but we can infer that it can run on any device with this OS and it is not bound only to the Samsung Smartphone. It will have the feature to connect with the Android device through NFC and the play button on the center of the panel can be used to launch the Games section of the Play Store. If That’s the case then I think, Samsung Gamepad can be a huge hit. As far its limitations is concerned then it will support all the devices with the display size of 4 Inches to 6.3 Inches. To get the best experience you can connect your smartphone to your HD TV with the HDMI cable and then play the games on your TV with the help of Samsung Gamepad. Samsung Gamepad is really robust as per the steel framework which has covered it. It will be available by next month and then we will update you about the way you can actually connect your Android devices with it and have the ultimate gaming experience.